(Clearwisdom.net) More than 1,500 Falun Dafa practitioners from Taiwan, Hong Kong, Japan, Singapore and Malaysia attended the 2008 Asia Falun Dafa Cultivation Experience Sharing Conference held in Korea on November 1, 2008. 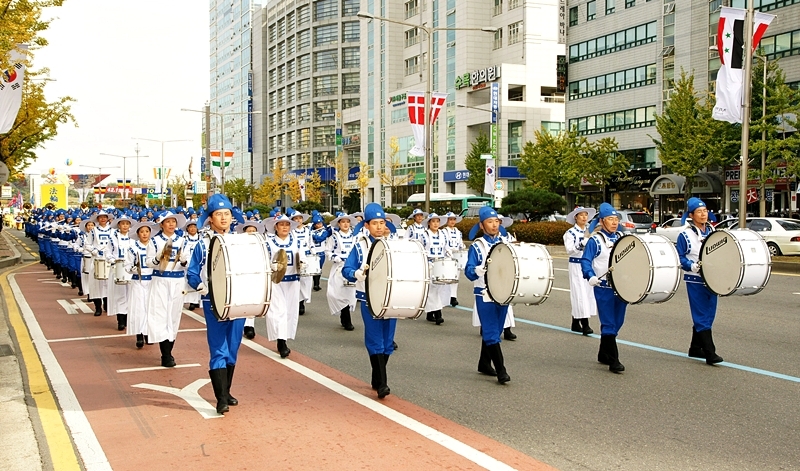 Practitioners held a grand parade on Olympic Avenue in Seoul the following day. 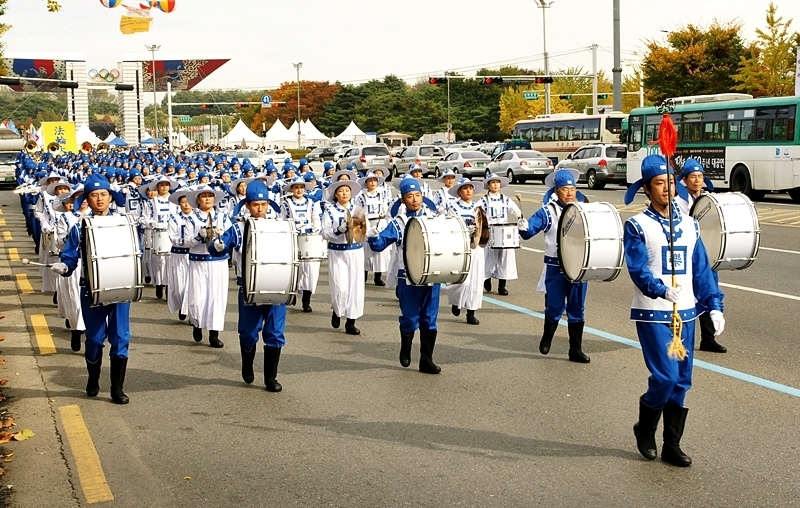 The Divine Land Marching Band led the parade. 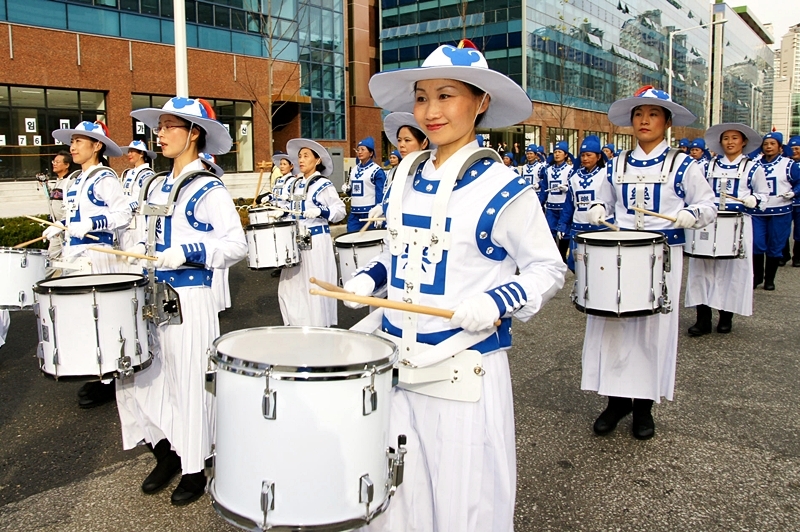 There were also a waist drum group, "celestial maidens" dancers, and a Korean drum group in the parade procession. 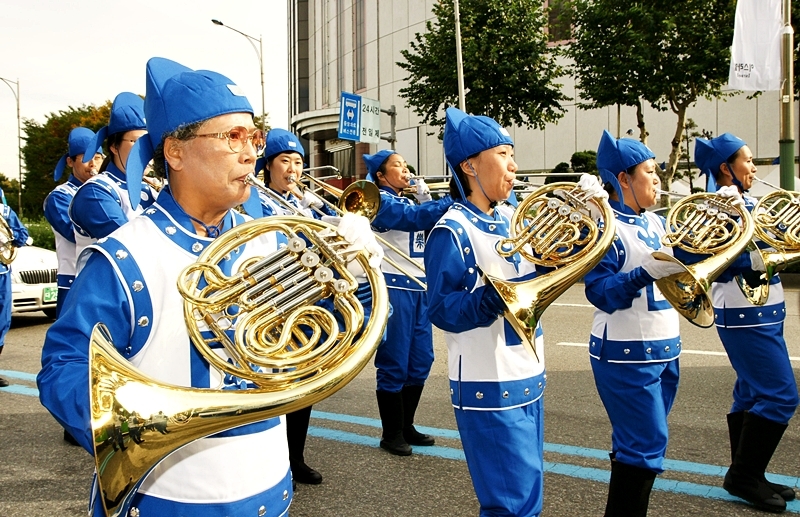 Spectators along the parade route were enthralled by the Divine Land Marching Band. They took photos or had photos taken with the band. 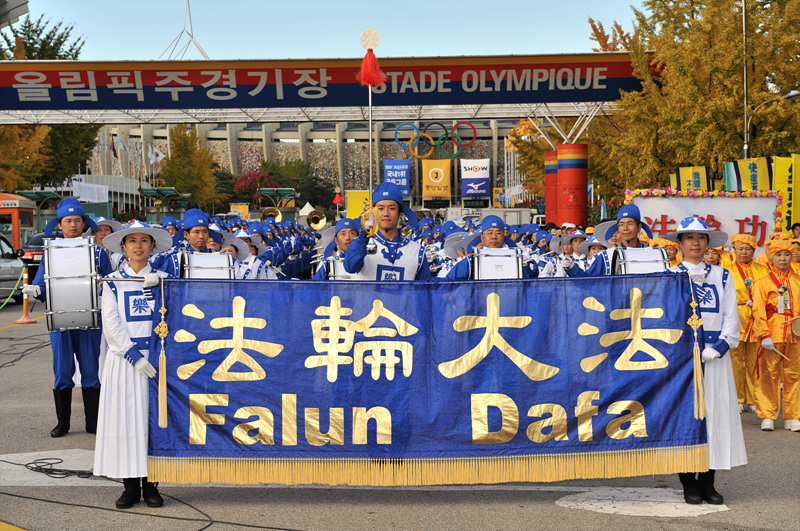 The Asia section of the band is composed of more than 160 Chinese Falun Dafa practitioners from Taiwan, Japan, Singapore and Korea. 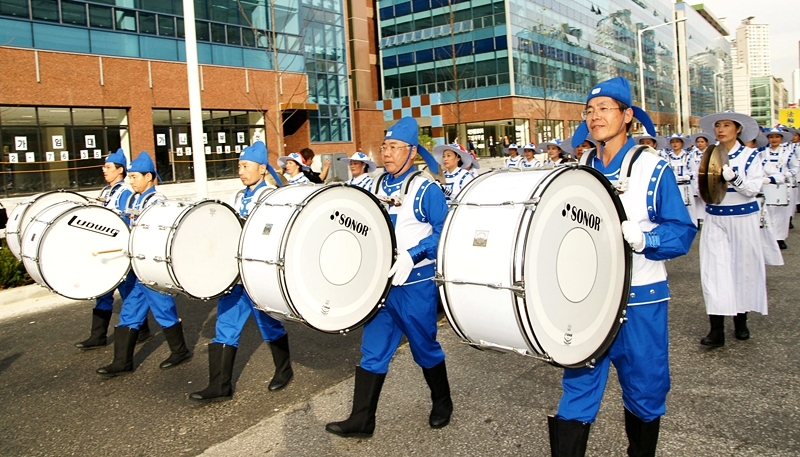 The coordinator of the Taiwan Divine Land Marching Band, Raowen Hung, said that since the Taiwan Divine Land Marching Band was established two years ago, it has grown to over 500 members. Forty members came to Korea this time. Mr. Jin from mainland China appreciated the band's performance. He told a reporter that in mainland China, people are selfish, money-oriented, and morally corrupt, and he feels that there is no hope there. 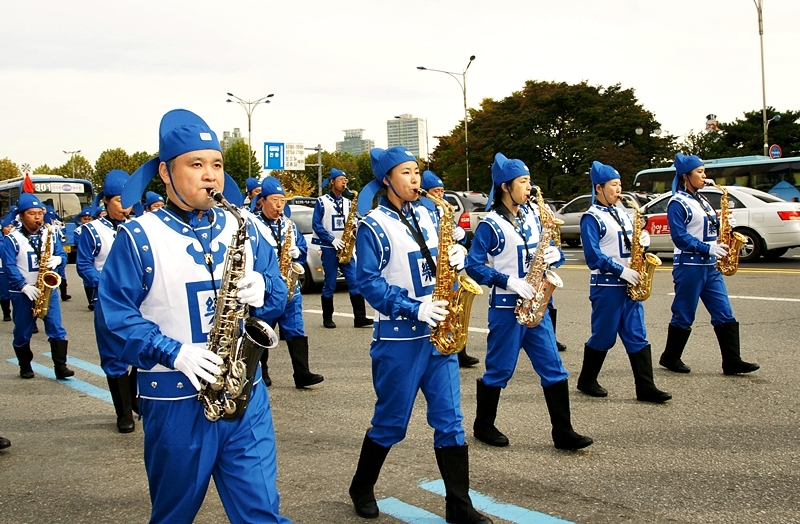 In this, his first time to experience the music of the Divine Land Marching Band, he seemed to hear a sound of hope coming down the earth. On several occasions during his interview he could not control his emotions and almost burst into tears. During the parade, two men from China followed the parade procession all along the route. One of them, named Bai, said that he used to believe the Chinese Communist Party propaganda, and he resented Falun Gong. But after coming to Korea, he made friends with a Falun Gong practitioner and learned the truth about the persecution and the practice. 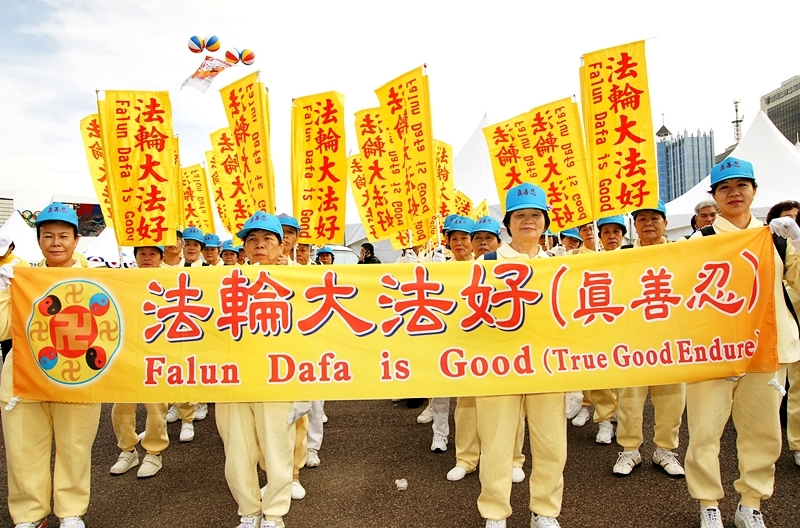 Now he feels that Falun Gong is good. Seeing the grand parade, he was once again indignant against the Communist Party for deceiving the Chinese people. Handmade paper lotus flowers were enthusiastically received by the parade spectators. They were pleased to have a colorful lotus flower with a bookmark carrying the message "Falun Dafa is good." Many took truth-clarifying flyers and listened to practitioners' introduction of Falun Gong and the persecution in China. Regarding the Chinese Communist Party's persecution of Falun Gong, some Korean people said, "Only a dictatorship can do such a thing," and, "The Communist Party should be eliminated." Former civil servant Ms Gao Hao Feng said that she does not like the Communist Party. She believes that people cannot live well in any communist country, and that was why the former Soviet Union collapsed. She said that the Communist Party should be eliminated. 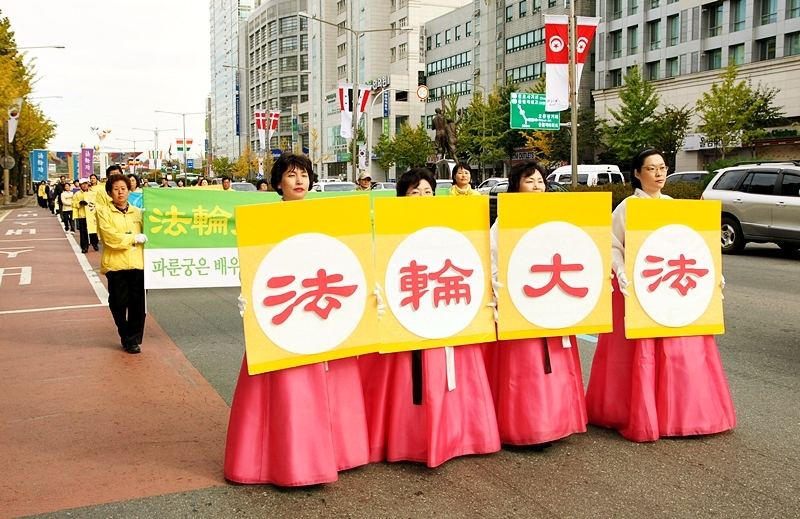 A citizen of Seoul, Mr. Yin said, after seeing photos about the persecution of Falun Gong, he returned home and searched the Internet to learn more about Falun Gong. He wondered how the Chinese Communist Party could do such barbaric deeds. He said that the Chinese Communist Party should disappear from the earth and that such cruel things as the persecution should not happen again. 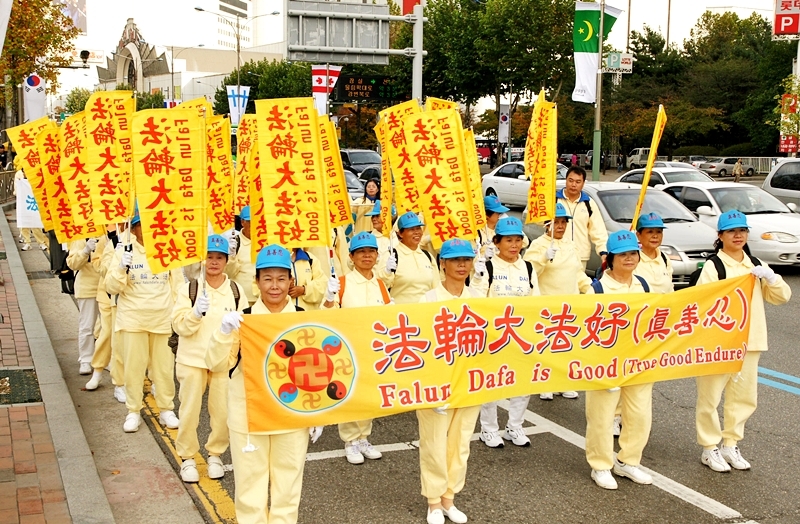 Spokesperson for the Korean Falun Dafa Association Mr. Wu Shilie said that the Asia Fa conference was successfully held in the only city university in Seoul. 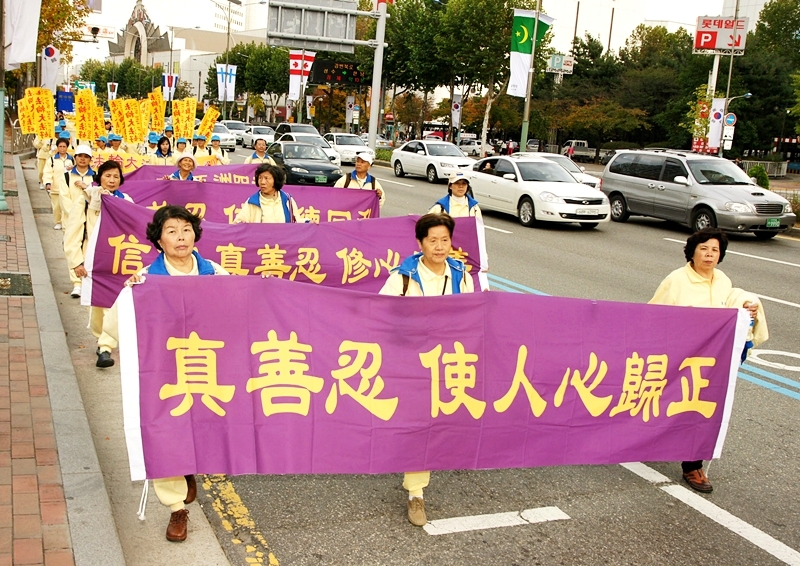 Many people in Korea practice Falun Gong and most of them are highly educated. Mr. Wu is a civil servant at a court. His colleagues used to be indifferent when he told them about Falun Gong before, but after the Beijing Olympics and the tainted milk powder scandal, they are willing to listen to topics on Falun Gong. 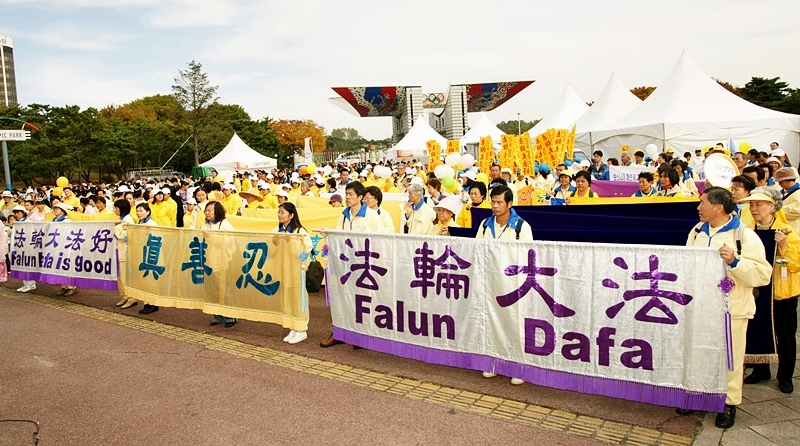 In addition, more and more people are practicing Falun Gong. There are now over 200 practice sites in Korea. Ms. Nie Shuwen, former deputy chief physician of Shanghai Medical University, now lives in Taiwan. 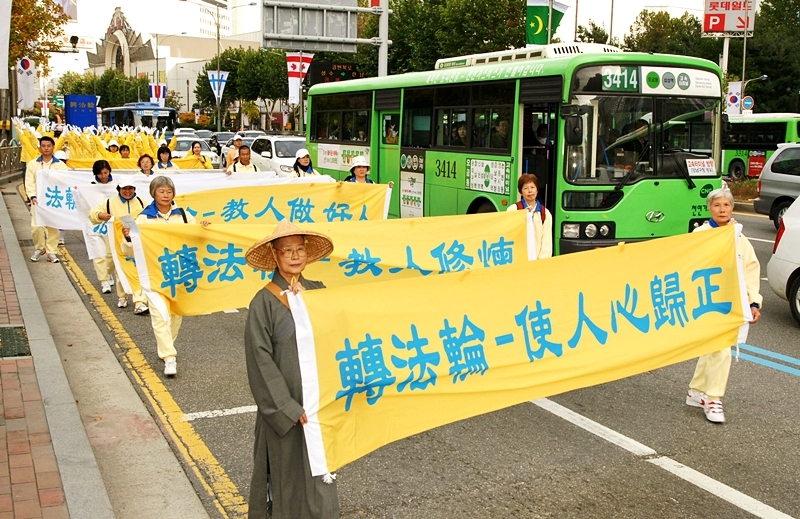 She said, "Since the Chinese Communist Party began the persecution of Falun Gong, many Taiwanese people were curious and approached Falun Gong for more information. After learning the true situation, they joined in the cultivation practice in Falun Gong. Young people particularly make up a large proportion of practitioners. 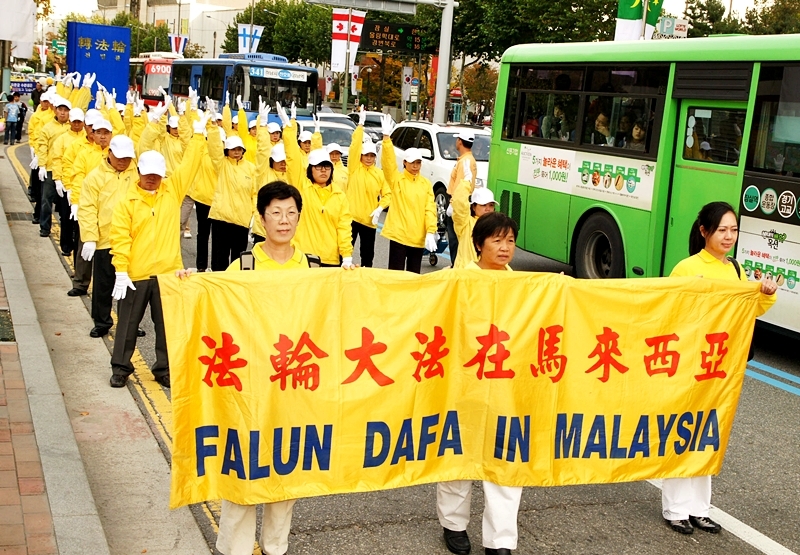 It is estimated that nearly 500,000 Taiwanese people practice Falun Gong."